How do children remember where objects are located? Remembering where things are in space and communicating to others where to find them are important skills that we need in our everyday lives. We can remember the location of things from our own perspective (to my left), by their proximity to other objects (next to the chair), or even using compass directions (on the south side). We are interested in how children typically remember locations and directions, and whether or not some spatial relationships are easier to remember than others. In our study, children watch as we hide a coin in one of three cups. Then they turn to face a second table, where they see three more cups in the exact same arrangement. We ask them to find the coin in the same cup. But which one is the “same” one? 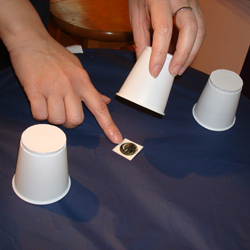 During one part of the study, children must use the landmarks in the room to find the coin (e.g., in the cup closest to the window). 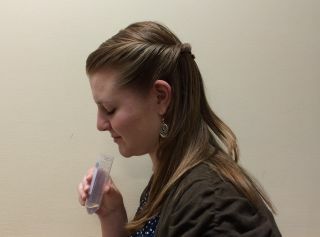 During another part, they must use the positions of the cups relative to their own bodies (e.g., the cup on their left). We want to know if one of these strategies is easier for children to learn than the other. In order to find out, we’ll measure how quickly children learn where to look for the coin. 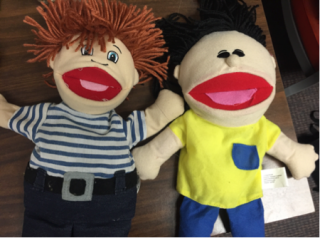 This study will help us understand how children begin to understand the spatial relationships between objects, and how they learn the meanings of spatial words like "left" and "right" or "north" and "south". This research is conducted in Living Laboratory at the Museum of Science by Peggy Li Lee at Harvard University. 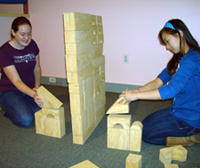 Challenge your child to build a tower that looks exactly like one that you build, using only verbal instructions. You can keep your child from seeing your tower by building a block wall. Describe what size and shape blocks your child needs for his/her tower, and in what order, direction, and orientation they should go. Is your child able to build a tower that looks exactly like yours, and how is it different or the same? What verbal commands are most useful for helping your child complete the task? Play a game of hokey pokey with your child and pay attention to how s/he follows your directions. Stand facing your child as you give instructions for the game, such as “put your right hand in.” Is your child able to move the correct parts of his/her body in the game? When playing, does your child put out the hand you ask for, or the one that mirrors your movements? At home, take a doll and place a toy in front of the doll and one behind it. Ask your child to give you the toy that is behind the doll. Next, place the toys to the left and right of the doll and ask for the toy to the left of it. In each turn, from which side does your child give you the toy? Is your child able to successfully give you the toy from the side you asked for? Does your child seem to find it easier to distinguish between “left and right” or “front and back? Do children prefer the explanations of a “powerful” character? © 2019 Living Laboratory  All rights reserved.